I know this blog has been very baseball oriented of late. Specifically perfect game oriented, but perfect games are pretty big deals to a baseball fanatic such as myself. Which is what makes what happened tonight so gut-wrenchingly painful. That's right, umpire Jim Joyce blew the call on the last out of the game. The batter was clearly out, but he called him safe. Watch the play yourself, if you can stomach it. For what it's worth, Joyce was devastated after the game and apologized to Galarraga personally: "I just cost that kid a perfect game. I thought he beat the throw. I was convinced he beat the throw, until I saw the replay." There have been 10 near-perfect games blown on the 27th batter. None as painfully as this. The nearest runner up was Milt Pappas of the Cubs in 1972 who walked the 27th batter. At least two of the balls were close enough to have been called strikes, but second year umpire Bruce Froemming didn't call them. Pappas got the next guy out and finished with the most anti-climactic no-hitter in history. He never forgave Froemming. The Commissioner of Baseball had a lot of power, if he chooses to use it. He's authorized to act in the "best interest of the game" and that clause has been used to change rules on the fly. The most famous instance being the Pine Tar Incident of 1983, but even more recently in the 2008 World Series Bud Selig himself was prepared to change the rain-out rules to prevent the Series from ending on a rain-shortened Phillies victory. He should do it now. There's no reason he couldn't over-turn Joyce's call and restore the perfect game. It's a unique situation. No one would cry "foul". The Tigers won anyway, so it wouldn't change anything that really matters. In the Pine Tar Incident the ruling of the umpires on the field was over-turned, and in that case George Brett had actually broken the rules. The call was overturned because the rule was basically determined to be out-dated and unnecessary. In this case, no rule was broken. It was just a bad call. A clearly bad call. Reverse it. There's no reason not to. The tragedy, of course, is that he won't. But expect instant-replay review in baseball, probably before the end of the season. In an attempt to lift your spirits, here's some footage of the Pine Tar Incident. Also, I wrote this in a facebook status comment and liked it: "As much as fallible umps are part of the game, so is the Commissioner and his broad powers to do pretty much anything he wants." 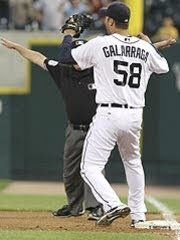 That's why, even as something of a baseball purist, I think the call should be overturned.